I am making this for four kids, so this recipe makes four small servings, or two large glasses. You could cut this in half or thirds if you want a serving for one. Peel and quarter oranges. I cut off the ends, and then cut down the sides with a sharp knife. So I end up with a whole orange with no skin. Then I cut into quarters. 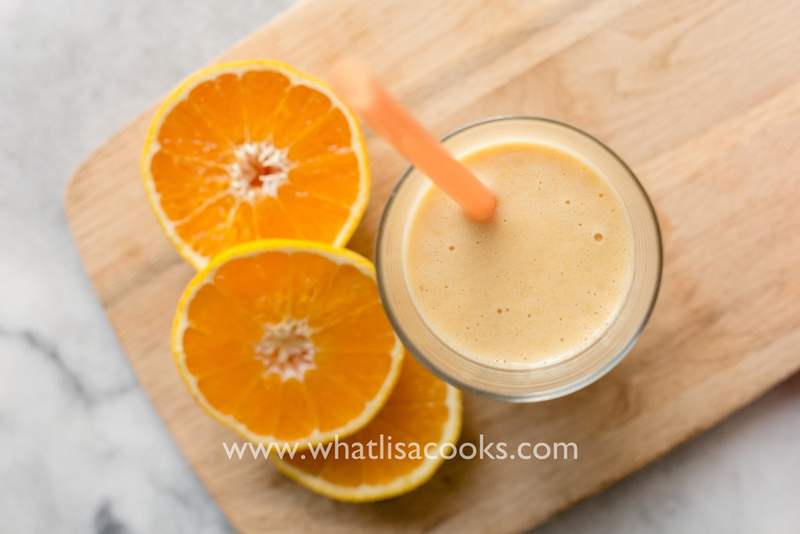 Put the oranges in the blender first, and then all the other ingredients, in high powered blender (I use my Vitamix). Start out pulsing slowly so the oranges release their juice. Once you have some liquid in the bottom, then you can turn the blender up to high to puree the whole thing. You could use fresh bananas, I just like frozen bananas because it makes the smoothie cold. I buy extra bananas, let them get ripe, then peel and break into pieces and freeze. Then I always have bananas in the freezer for smoothies. For protein powder I prefer a pure whey powder - with no added fillers or sweeteners. This is the brand I buy. It's just whey, nothing else. It has 15 grams of protein per 1/4 cup, so it really gives a nice protein boost in the morning.